Today GBPUSD is mainly under the influence of Crude Oil Stocks change in the US and Bank of England announcement regarding the interest rates; however Industrial Production in the United Kingdom for March came lower than the expected rate. 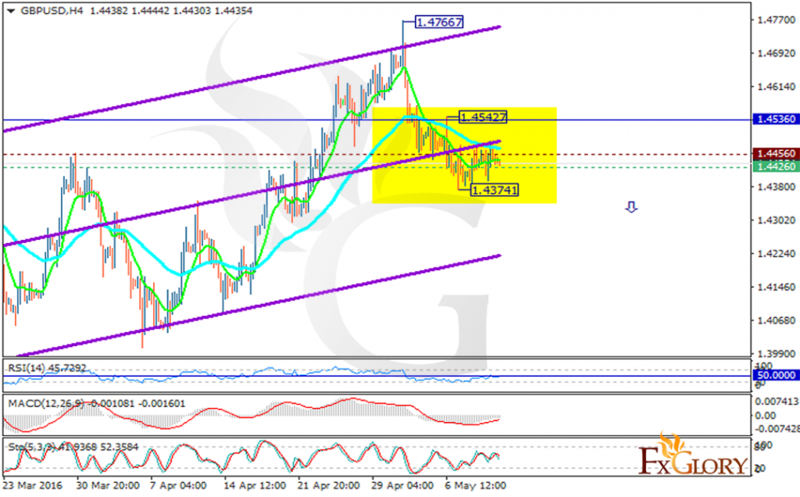 The price is finding support at 1.44260 with resistance at 1.44560 which both lines are below the weekly pivot point at 1.45360. Indicators are showing price decline; the MACD indicator is in negative territory, the RSI is below the 50 level and the Stochastic is signaling price fall as well. The EMA of 10 is located below the EMA of 50 confirming the price decline in the last recent days. Regarding the indicators signaling price fall, short positions are recommended targeting 1.4400.